Zhu Da (c.1626-1705) was a descendant of the Ming royal household. Dynastic upheaval in the 17th century had made his life difficult and also shaped his eccentric character. 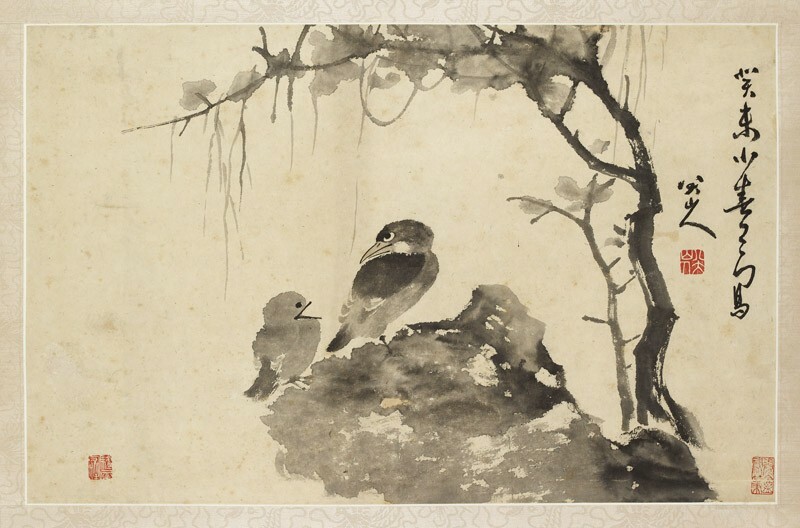 Zhu sought refuge in a Buddhist monastery after the fall of the Ming dynasty (1368-1644) but later left his monastic life and developed a career as a professional painter. His paintings feature bold use of ink, sharp brush strokes, and succinct composition. Birds and fish in his paintings often have an aloof look, as seen in this painting, representing Zhu's indigination at the fall of his country and family. Lent by Quentin Cowen, 2013.